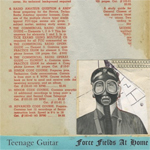 Original Release Notes: For the most discerning aficionados of Robert Pollard and Guided By Voices, Teenage Guitar offers experiments in spontaneity and lo-fi witchiness and wizardry, exploring multiple moods and styles. This is pure high-potency solo Pollard (vocals, guitars, piano) with occasional assistance from Greg Demos (drums) and Joe Patterson (bass). Brewed in the home laboratory using a historic mid-90s Tascam 488 cassette recorder, without professional engineers or adult supervision, Force Fields at Home recalls the sound and spirit of mid-'90s GBV EPs like Clown Prince of the Menthol Trailer. Only the lyrics were composed ahead�the music flowed spontaneously while the tape ran. Don�t blink, these will disappear quickly.